Unlike the conventional Electric Lift Chairs which have a height restrictions range 5'-2"
BACK PAIN SUFFERING, and is Aerospace Engineered to your Biometric Dimensions. 2. Exclusively, Scientifically Engineered and Manufactured, Central Islip, New York. 3. The Zero Energy Lift mechanism range is 40 - 1,000 lbs weight lift capacity. 6. Take it with you everywhere you go. 7. Aerospace engineered light weight frames. 8. Aerospace engineered seat cushions. 9. Aerospace engineered back support cushions. 12. Seat Width designed to your Biometric Measurement. 13. 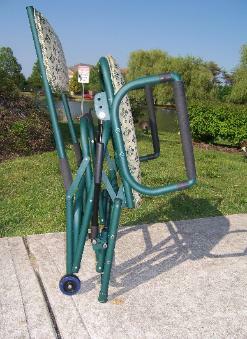 Seat lift angle 45 degrees and Adjustable to your comfort. 14. Rear wheels that accommodate mobility. 15. The Interchangeable Lift Cylinders accommodate weight lost or gained variations. utilized as a regular portable chair or, a chair. 19. Life time free maintenance required.